tThe Cousteau Society has committed to the preservation of the vaquita—the most endangered cetacean in the world—by partnering with the Mexican scientific consortium Oceanides Conservación y Desarrollo Marino, A.C. This consortium works on sustainable use of marine and coastal resources in the Sea of Cortez, and on the vaquita in particular with Dr. Lorenzo Rojas Bracho and Dr. Armando Martín Jaramillo. DONATE NOW TO SAVE THE VAQUITA! The vaquita, also known as vaquita marina and Gulf of California porpoise, is the world’s smallest porpoise and probably the smallest cetacean, no more than 150 cm long. With its dark gray back and light belly, its most visible characteristics are the black rings around the eyes and mouth. It is probably the most endangered species of marine mammal on the planet. It is found only in the Sea of Cortez, or Gulf of California, on the western side of Mexico. The species is classified as “critically endangered” by the International Union for Conservation of Nature and Natural Resources (IUCN) Red List as well as by CITES (Convention on International Trade in Endangered Species of Wild Fauna and Flora) and by the government of Mexico. 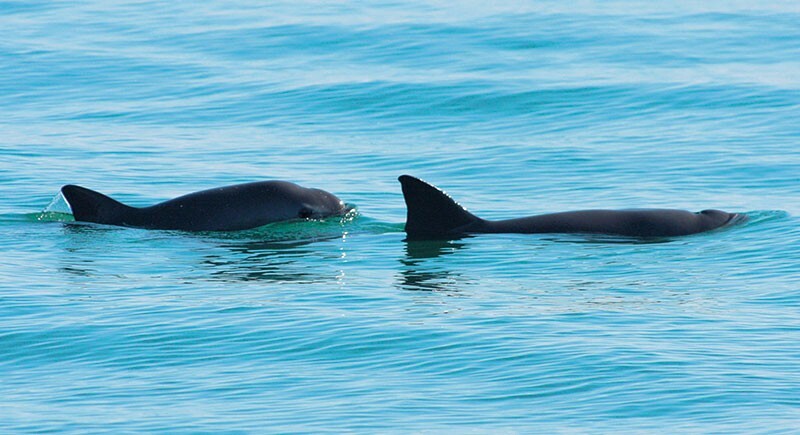 Genetic studies have shown that the Gulf of California porpoise, or vaquita, is a naturally small population. It is also the only species of marine mammal endemic to Mexico. Because there are so few, the vaquita was unknown to scientists until the second half of the last century. What is the primary threat to the vaquita? The primary threat to the vaquita is being caught accidentally in fishing nets, especially gillnets, that target other species like sharks, rays and shrimp. 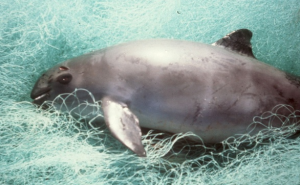 Studies estimate that 40 to 80 vaquitas die in nets each year, more than are born. The species has fallen from about 600 individuals in 1997 to 150 in 2007, a drop of 70% in one decade. What is the Mexican government doing to save the vaquita? – support for fishers who are willing to change their activities, their practices or their fishing equipment. What is the Cousteau Society doing? The Cousteau Society is working as a partner with a Mexican scientific team. 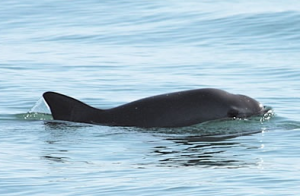 Vaquitas emit a high-frequency sound that can be distinguished from other biological acoustic signals. This makes it possible to use acoustic detectors conceived specifically for the species. The idea is to put in place an autonomous network of hydrophones that could collect data continuously for weeks or even months. This would let researchers track the abundance of the population and its movements, which is essential for any conservation plan to evaluate progress and predict the success or failure of a given action. Such an acoustic network is the most effective and most economical approach and, in the end, entails the least disturbance for the already fragile vaquita population. This first project is being supported by the French non-profit organization Save Your Logo. Many species that are or may become endangered are found in the logos of companies and institutions throughout the world. The principle behind “Save Your Logo” is simple: enlist these brands in conserving the species that have contributed to their success and ask the companies to invest in biodiversity conservation activities. The “Save Your Logo” operation is a program of the Endowment Fund for Biodiversity. For the vaquita project, “Save Your Logo” is partnered with MAAF Insurance, and more recently the Grenoble School of Management, both of which use a dolphin as their emblem , a unifying symbol if ever there was one. Other “Save Your Logo” programs can be found at www.saveyourlogo.org.